Aquarobotman Science & Technology Co. of Shenzhen, China has produced a portable underwater drone designed to undertake underwater inspection and observation tasks.Measuring 404mm in length, 290mm in width and 114mm in height, the 3.4kg model, monikered Nemo, can descend to depths of 100m, and at a top speed of 2m per second. The unit’s main sealed cabin incorporates polycarbonates (PC) and fibre glass, while its shell has been fashioned from Polyphenylene oxide (PPO), and the company claims that it can operate efficiently across a temperature band spanning -2⁰C to 35⁰C. Depending on operational requirements, the Nemo can be supplied with two types of Kevlar tether: a 50m-long version, weighing 0.6kg, or a 100m, 1.1kg variant. Both cable types feature a diameter of 3.8mm. The Nemo has been kitted out with five-bladed propellers and an arrangement of four thrusters – two set horizontally and two vertically. The thrusters make up the unit’s patented ‘QAS-balance’ configuration, which was designed to provide optimal stability: a particular bonus when it comes to gathering video footage of its surroundings. 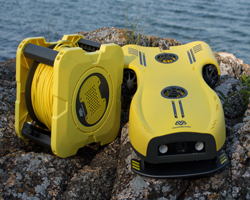 The compact nature of the ROV is also intended to simplify transportation and deployment. The unit can be ordered with a waterproof, ventilated backpack, enabling the user to carry the unit (plus a couple of battery cells) aboard a plane. He/she can launch the lightweight ROV from the side of a boat, or from shore, by hand – even tossing it directly into the water. The Nemo runs on Aquarobotman's in-house-produced C-Hyperhelix brand of detachable, waterproof, polymer lithium battery cells. The ROV has a 4,000mAh battery capacity and can use these battery types to produce three hours of working time. The company estimates that it should take 2.5 hours to charge each battery – so, if a user charges up a couple of these battery cells in advance, they can bring them to the operational zone for a full day’s worth of operations. The overall weight of each C-Hyperhelix battery is 760g. The customer can also incorporate a WiFi base station into the set-up. Powered by a detachable, 18650-type lithium battery, and measuring 105mm x 75mm x 159mm, this station weighs 337g and has a working period of eight hours. Imagery is captured by an ultra-HD camera offering 150degs field of vision and capable of a maximum resolution of 4K/30fps. However, users can also specify 2.7K/30fps, 1,080p/120fps and 1,080p/30fps resolutions, depending on their preferences. When used in conjunction with a dedicated app, the base station link enables users to control the ROV via their smartphones or tablets, provided they are running on iOS 10.0/Android 5.0 or later systems. Real-time imagery can be transmitted to these devices at a rate of 720p at 30fps, and such relays are effective at a range of up to 50m, provided no objects (including offshore installations, vessel superstructures, etc ) interfere with the signal. As well as fulfilling commercial tasks, this video transfer capability can be used for more leisurely pursuits. For instance, a recreational boat owner could send live footage of marine life and fauna to friends and family who have the app installed on their devices. These recipients can also use the app to zoom in and out on certain features. This capability also provides scope for persons to don virtual reality (VR) goggles for a more immersive viewing experience – perhaps livening up links between marine research projects and shore-based, classroom environments. It is this level of flexibility that has prompted Aquarobotman to describe the Nemo as both “a tool and a toy”.